< Since [[Wikipedia:Not_invented_here|NIH syndrome]] is often a cause of brain death, they deleted it. 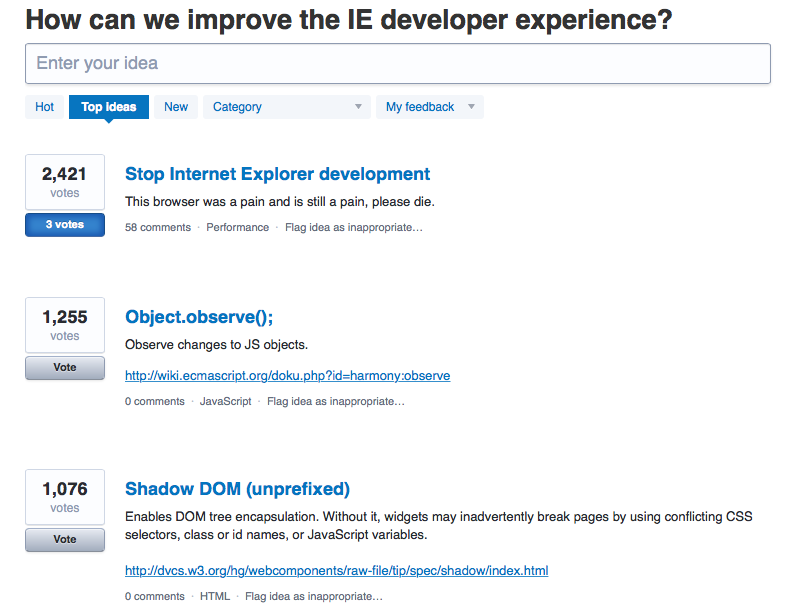 Every next day there was a new one that basically said the same thing – **Stop Internet Explorer Development**, maybe just slightly reworded. And yes, they kept deleting these post! This suggestion was so popular that it was getting to the top very quickly, sometimes it was reaching the top position before they were removing it. > Since [[Wikipedia:Not_invented_here|NIH syndrome]] is often a cause of brain death, they deleted it. Every next day there was a new one that basically said the same thing – **Stop Internet Explorer Development**, maybe just slightly reworded. And yes, they kept deleting these posts! This suggestion was so popular that it was getting to the top very quickly, sometimes it was reaching the top position before they were removing it.